MGoBlog has been railing against the use of the naked bootleg/waggle that Michigan has deployed a few times this season, and for good reason: it hasn't been very effective. Brian has chalked its lack of effectiveness up to teams being unconcerned with Michigan running from under center. But after seeing Minnesota defend it, I think there's another reason it's been suboptimal: no matter where Michigan is running from, the quarterback is always more of a threat. It's in the third quarter and Devin Gardner has already been put into the game. Michigan is marching down the field when they get under center. Brandon Moore is lined up as an H-back. Minnesota is in its 4-3 formation with a safety pulled into the box. 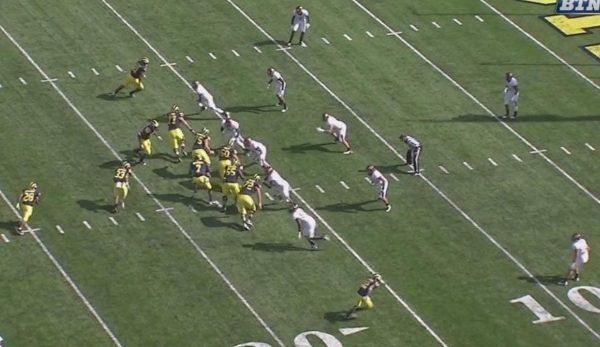 Michigan is running a naked bootleg, which means that there won't be a blocker for Gardner once he rolls out. As such, Minnesota's weakside defensive end is unblocked. Moore will pull across the formation and head to the flat as a check down. A moment later and Gardner has turned his back to the weakside to for the play action. The Minnesota defensive end isn't heading toward the handoff. 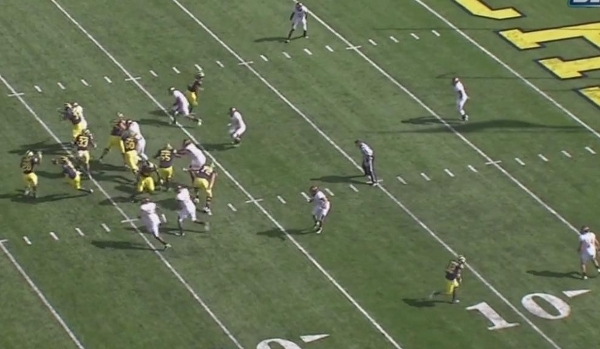 Instead, he's playing contain and getting upfield with Gardner. As Gardner fakes the handoff, Moore has pulled across the formation and headed to the flat. The defensive end is keying on Gardner. As Gardner turns, he's staring down a defensive end and will scramble for the most impressive four yard run of the season. The most disappointing part of this play is that the handoff would've worked. A few screens up, you can see Stephen Hopkins entering the B gap as a lead blocker. If Gardner hands the ball off here, Toussaint has nearly a clear path to the endzone. 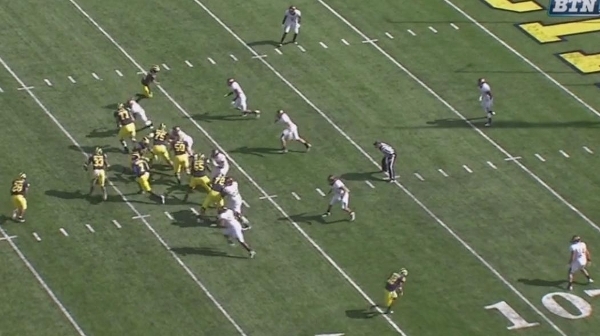 Instead, Gardner turns into an unblocked defender. The reason there always seem to be defensive ends in the QB's face on these plays is that Gardner and Denard are both far more dangerous than any of Michigan's running backs. So when a defensive end finds himself unblocked, he's already been coached to stay with the quarterback, whether it's under center or in the shotgun versus the zone read. Honestly, the only way to make this play effective is to actually hand the ball off more. 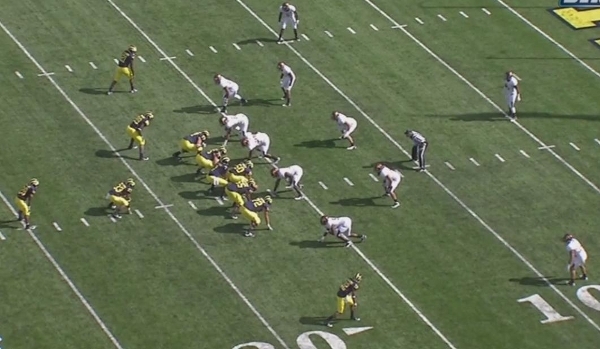 Michigan is trying to get teams to cheat from a formation that they don't have a base play. Here, you can see the hole created in the run game for Toussaint despite never getting the ball. Now whether or not running more from the I to set this up is a smart offensive strategy (Michigan would have to play from a formation that they are statistically less effective from) is up for debate, but if Michigan starts running out of the I formation more often, this play will be more effective. If Borges really does abandon the I formation running game entirely, this play will be removed from the playbook as well. Looking at the pictures, it seems like Huyge kind of blows his block. If he keeps his guy inside, Gardner at least has a quick hitter to Moore. There's a lurking player in the secondary, so it's probably only 4-5 yards, but it wouldn't be complete chaos like it turned out to be. Huyge definitely blows his assignment here, but that DT wasn't the primary reason Gardner had to scramble (it was the unblocked DE). It's tough to see in these stills, but I don't think there's any way Gardner gets a pass off to Moore in the flat. The DE was in his face too quickly. At best, Gardner would've lobbed it into the flat where there was a linebacker in the general vicinity that may have picked off a floater.